This is my first installation of a series of posts for the guys. The slightly inept, earnest guys who need to cook a quick, easy, and impressive one-dish dinner. Given that target audience, I have to say that the first one to request this recipe was my sister. So if you are a slightly inept, but earnest cook, this one’s for you, whatever your gender may be. This pasta is a favorite in our house precisely because it can be cobbled together in as long as it takes the water to boil and the pasta to cook. Why is this easy? There are just four ingredients. Why is this special? Fried, “blossomed” capers and caramelized onions with a sweet-soft cauliflower that has just enough texture to create a perfect sauce. The resulting dish is synergistic and transcendent. And, I must add, if there are any, this pasta tastes fabulous reheated for lunch the next day. This is also a great dish for this awkward season of the year when spring vegetables are barely entering your market, but winter veggies are all but done. Cauliflower is an undervalued treat in pasta and the fact that you can happily just toss it into your pasta pot to boil with the pasta makes it a no-brainer. So ladies? Gentlemen? Novice-earnest cooks? Listen up. Since you have very few ingredients in this dish, you have to treat each of them nicely. Start with the onions. Caramelizing onions is really not hard to do, but you have to be careful how thickly you cut the onion before cooking. Cut too thick, the caramelizing will take all day long. Also, since you are using a thin, long pasta, it melds beautifully with the pasta if you cut your onions long and thin as well. When you sauté them, you want the onions to go past the point of translucent and soft to a color of….you guessed it, caramel. The sugars break down and your onions will actually sweeten up with no sugar added. 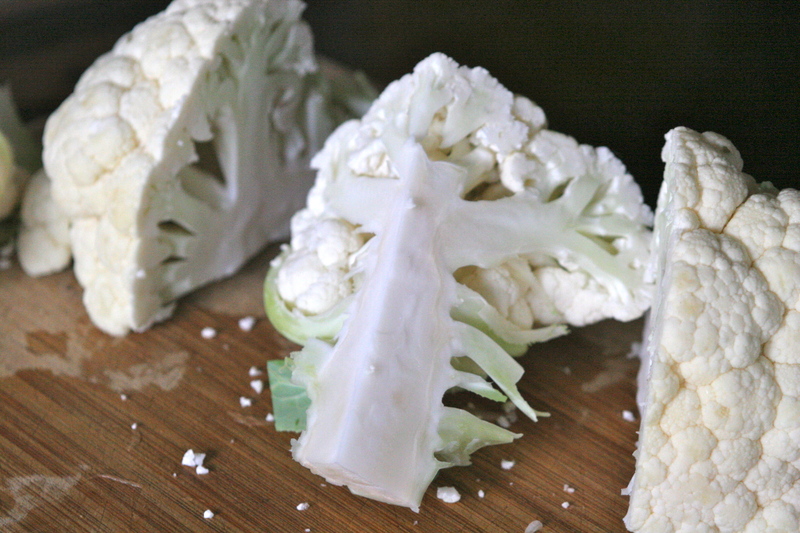 A tip for the cauliflower is to remember to use not just the florets (the end of the cauliflower, or the unopened flowers of the plant), but also the stem below it. While you are chopping, taste the raw white stalk just below the florets and compare it with the floret itself. Sweet, right? Don’t dump that part, just chop it up into little cubes about the size of the florets you are going to use. Finally, you will use another unopened flower in the dish. Capers (or caper berries) are really just unopened buds that have been preserved in brine or directly in salt. If you put about a half-inch of oil in a little pan on high and toss in the rinsed and well-dried capers, they actually pop open and “blossom,” resulting in a crunchy-salty delicious ingredient to your pasta. For the eager chefs seeking bonus points, I lied. I didn’t count olive oil as one of the four ingredients. I just assumed that your cooking significant-other/roommate/mother has some in the house that you can sneak. However, if you really want to impress, get a bottle of really good olive oil to drizzle over the top of the finished pasta. A good fat is just like salt. It enhances the flavors in your dish and takes it to the next level. So novice cooks? Go out there and make this dish. Let me know if you have any touches of your own that worked well. If you are missing the meat, I think that pancetta or chopped prosciutto would taste fantastic with this. Just add it near the end of cooking the onions, before tossing in the drained pasta and cauliflower. 1. Start the pasta water. Boil water in a very large pot. When it comes to a boil, add 2 tablespoons of any kind of cheap salt. 2. Saute the onions. Heat your basic olive oil in a frying pan to medium. Cut your onion in half from top to root end. 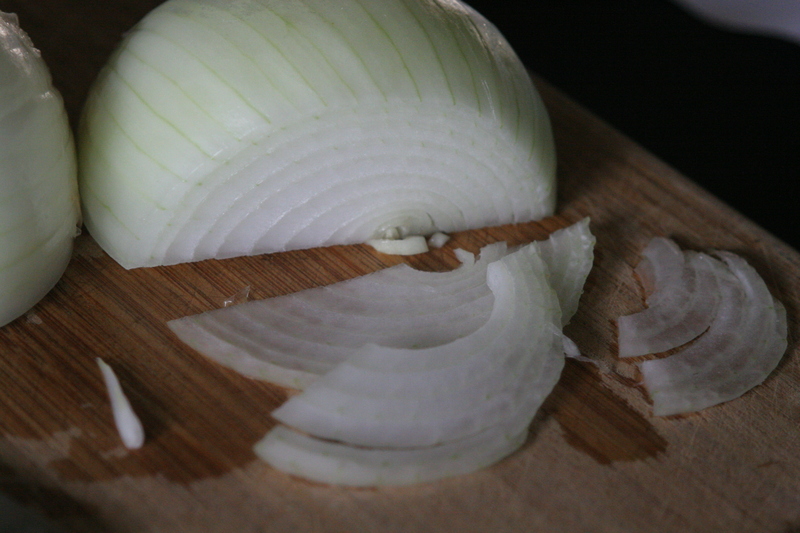 Place the cut side of each half on your cutting board and carefully cut very thin, long slices of onions. Stir them into the heated oil and stir every couple of minutes. Once they are translucent and soft (after about 10 minutes if you cut them very thin or 15 minutes if you didn’t), turn the heat down to medium-low. Keep stirring occasionally if you don’t want any darker brown bits (but I actually kind of like them that way). 3. Chop the cauliflower. You can do this any way you like. If you need a suggestion, I like taking the entire cauliflower and quartering it. I turn it with the floret-side down on the cutting board and then split it down the stem. I repeat with each half. This makes it easy to cut out the core of the cauliflower and chop it into little 1 inch cubes. In turn, it allows me to break apart all of the little florets with my hands into pieces of roughly the same size. If you like bigger pieces of cauliflower in your pasta, by all means do so. Just cut the stem pieces about the same size so everything cooks at the same rate. 4. Cook spaghetti and cauliflower. Once the pasta water has come to a boil and you have added the salt, toss in the cauliflower and pasta and cook until the pasta is al dente. I like the cauliflower to be softer than if I were serving it as a vegetable side dish since the softer cauliflower breaks down slightly and coats the pasta well. 5. Fry the capers. As soon as you have added the spaghetti and cauliflower, heat 1 inch of oil (canola or olive oil is fine) to high. When it begins to shimmer, add half of the dried capers. They will take about 20-40 seconds to pop open (“blossom”). Carefully fish them out and let them sit on paper towels to absorb the extra oil. Repeat with the remaining capers. They should be crunchy when done correctly. 6. Bring it all together. When the pasta is done cooking, drain the cauliflower and spaghetti and then add to the frying pan with caramelized onions. Toss well to coat. If using, add pepper flakes (you could also add them at the end of cooking the onions) and a couple of glugs of very good extra virgin olive oil. 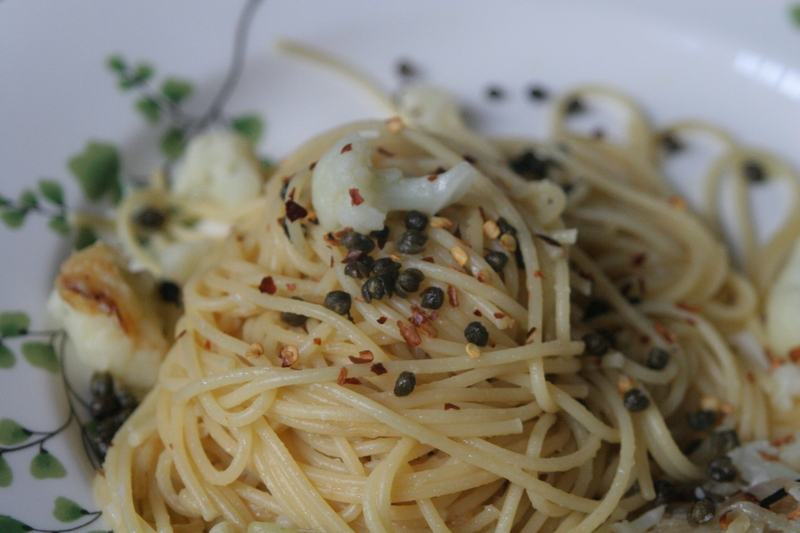 Sprinkle fried capers on top. Grate cheese if you would like, but it’s plenty salty without. This is one of those pastas where vegans do not miss the cheese. (However, I still usually add ample grated cheese.) Enjoy! *Notes: If you really want to splurge, buy salted capers. These are often imported from either Spain or Italy and are absolutely superior in taste because they don’t get a vinegary flavor that the brined ones have. Whichever you use, give them a good rinse and lay them on a paper towel to dry before frying up. This entry was posted in Cauliflower, Inept-but-Earnest Cook's Night, Pasta, Vegan and tagged Caramelized Onions, Cauliflower Pasta, Easy Dinner, Fried Capers, Guys' Turn, Novice Cooks, Vegan. Bookmark the permalink. This is the first time I ever heard of cauliflower with spaghetti, but for sure caramelized onions gonna be good! Will you make this for me? It looks fabulous and has all the stuff I like in it. Kudos! Of course! Come on over! Who says gourmet means a huge list of fancy ingredients? Thanks for this simple, yet delicious recipe! Thanks there, my biggest fan. I’ll do something meaty for you soon. I have a bias for this recipe of all three you have posted so far because it has ingredients everyone in my house can eat. But…you’ve also nailed here a ‘voice’ that is a genuine pleasure to read, and that really works to inspire the reader (this reader, at least) to go out and cook that pasta. Well-done! HI there, Veronica directed me to your blog. I love it! However, I am not sure how you juggle all this plus your family & work. The most I can manage before I leave for work is a spinach and fruit smoothie. Keep the delicious and healthy recipes coming. I can’t wait to try some of these out. I get to report having eaten this delicious dish prepared by la Cuoca (not-so-)ciccia — with the help of her lovely assistant [who shall go unmentioned, so he doesn’t get any further flack for improper onion-cutting ; ) ] — at their home. Lucky me!!! And it was, I assure you, as delicious as it sounds…, and then some. Keep the astounding food revelations coming, CC! OK, I’m not a guy & I’m certainly not new to cooking …but the word “inept” caught my attention (it may be just a bit harsh as applied to my cooking – – but only a bit). This pasta is delicious. The capers class it way up toward gourmet (we added a few extra) & the caramelized onion/cauliflower combination is delicious. We didn’t have thin spaghetti on hand but the dish was great with the short thickish twisted shape we had. I’m so glad you’ve found my site and glad you liked the capers. I do that with several pasta (the capers, that is) and also just plain vegetable dishes. They add so much. Just made it again tonight…thanks for the quick, easy, delicious recipies! Please keep ’em coming for the inept like me! Anyway, thank you again, Cuoca, for saving another Tuesday night dinner from boring-and-blandsville!